1.) Instead of the same old peanut butter, try making your own nut butters, or buying nut butters such as almond or cashew. In addition to peanuts actually being a legume and not a nut, and having ‘anti-nutrient’ lectins in them, peanuts are often coated with a mold called aflatoxin which has been shown to be carcinogenic. Nut butters can be bought, or easily made in a food processor. You can also use seeds such as sunflower seeds. Add a little cocoa powder, coconut oil and dates, and you have your own nutella! This is a protein packed spread that can be used as a dip for fruit, or in a whole grain sandwich with apple slices. 2.) Tired of the same old egg salad sandwich? Why not try a frittata with the leftovers from dinner? Everything goes in one bowl, then in one pan, in the oven to bake, and voila! A delicious and nutritious lunch for your loved ones. Some classics are potato, cheddar and broccoli, or ham, swiss and asparagus. Eggs from healthy chickens are loaded with protein, lecithin, methionine and cholesterol. Yes, cholesterol! Don’t be fooled, in addition to being a part of all of our cell membranes, cholesterol is essential for many functions in the body including stress hormones to help cope with a tough day at school, and making bile to break down fat. Just be sure to get your eggs from pastured chickens, that eat grass and bugs! 3.) When it comes to fruit somehow we have been sold on the idea that buying prepackaged fruit cups is easier than cutting up some fresh fruit and putting it in a container. Check the ingredients of your fruit cups and make sure there is no high fructose corn syrup or added sugars. Fruit is sweet enough on its own. And if your fruit salads are getting boring, try making a yogurt dip sweetened with raw honey and vanilla bean. This will add some healthy fat to the snack, slowing down the uptake of the sugars from the fruit, and provide longer lasting energy. Use fresh, seasonal fruit for your fruit cups, and your kids will be sure to love it just the same! 4.) All kids hope that their parents included something sweet for their afternoon snack, or for their after lunch dessert. Instead of boxed cookies or nutrient void crackers, why not make your own no-bake energy balls. There are thousands of recipes out there to choose from that take no time at all to prepare. Some foods to include here are rolled oats, nut or seed butter, coconut oil and flakes, dates, flax seeds, and chocolate chips. These are packed with healthy fats, simple and complex carbohydrates and protein, offering a balanced and nutritious snack. 5.) To keep them hydrated, instead of juice boxes from concentrate that can be loaded with added sugars, and are pasteurized killing all of the essential enzymes, why not try making your own! You can buy some BPA-free Rubbermaid juice containers and if you have your own juicer, spend 15 minutes making a variety of fresh fruit and vegetable juices. You can freeze them for the week and then add them to the lunchbox, keeping everything cool as they defrost to be ready to drink at lunchtime! Fresh juices are loaded with easily absorbable nutrients for a fast energy boost. If you don’t have a juicer, try making your own vitamin water by adding fruit to water, giving it flavor and nutrients. It is easy to become uninspired and feel tapped for ideas when you have to make lunches 5 days a week for 10 months of the year. Add to that the stress of keeping them interesting and nutritious and it can start to eat away at your time and your conscience. Make sure to plan and prepare with a weekly food calendar to help you create your grocery lists and stay ahead of the game. Every chef knows that you can’t start your day without a prep list. 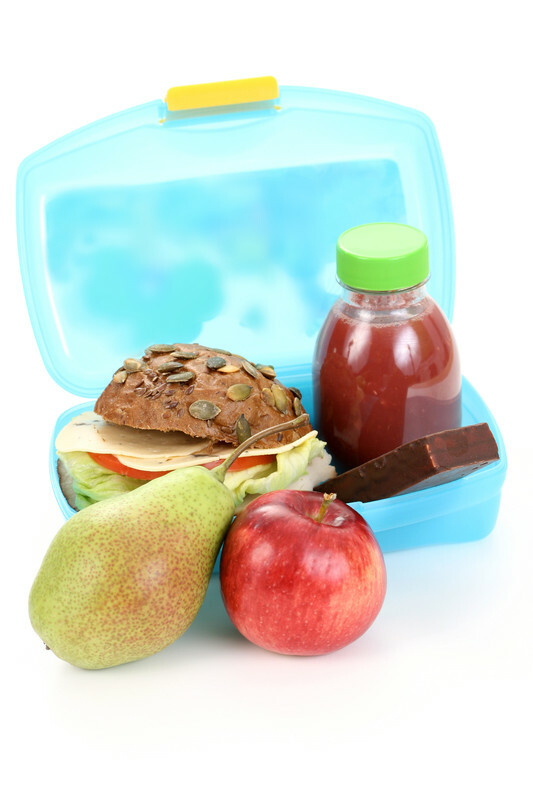 Remember, the proper nutrition will not only keep your child healthy and strong, but it will help your child stay focused and alert at school.